When it comes to winter, we Canadians are a hardy bunch. A little cold weather never stopped us from getting to work, firing up the grill, or even diving headfirst into Lake Ontario. But what about painting? Can you paint your house in the winter? Does paint dry properly in cold weather? The answer to that question all depends on three things: whether you’re painting indoors (interior walls) or outdoors (exterior walls or fences), exactly how cold it is, and the kind of paint you’re using. Let’s take a closer look at the ins and outs of painting in cold weather. Painting the House in Cold Weather: Should You Do It? There’s nothing stopping you from taking on certain paint projects between spring and fall. However, it’s important to understand how temperature will affect the ease of use, drying time, and overall performance of your paint. Most house paint is designed to be used in temperatures above 50°F/10°C. When the temperature is lower, the paint becomes thicker and more difficult to tint or mix, often requiring more stirring and shaking before it’s in a useable state. The greater viscosity makes it harder to achieve smooth, even rolls and brush strokes. Latex paint can freeze if the temperature drops below freezing (32 °F/0°C). Usually, the paint is still useable if you mix well and allow it to thaw completely; however, latex paint that has been allowed to freeze and thaw several times may become too thick and lumpy to use. It’s for this reason that we recommend painting in temperatures above 50°F/10°C and storing paint in an environment that doesn’t fall below freezing. House paint is either water-based (like latex or acrylic paint) or oil-based (like enamel paint). The difference between the two is the substance used to keep the binding medium and colour pigments from hardening in the can. Latex paints use water as a solvent, while oil paints use natural or synthetic oils. When paint is exposed to the air, the water or oil that keeps the paint wet begins to evaporate. This process allows the paint to bind to the surface and form a hard layer. In normal conditions, latex paint is dry to the touch in about 3 hours; oil paint dries after 4 hours. But when the temperature is low and evaporation decreases, the rate at which paint dries slows down as well. This change occurs even if the temperature falls after the paint is applied but before it is fully dry. The colder it gets, the longer it takes for paint to dry, leaving the work vulnerable to blemishes for longer. While it may be possible to complete your painting project in cold weather, the results may not be ideal. Oil-based paints applied in low temperatures are more likely to blush and show uneven colouring once dry. Latex paint is more susceptible to cracking and peeling. Generally, cold-weather paint jobs are susceptible to poorer longevity and long-term performance. The final product may be acceptable for the time being, but it’s more likely to require touch-ups (and sooner). In most cases, it is better to wait until it gets warmer to invest the time and renovation bucks in a house painting project. As mentioned earlier, the minimum temperature for applying most paints is 50°F/10°C. However, there are paint formulas designed to tolerate temperatures as low as 36°F/2°C. Some ‘cold weather’ paint products on the market include Dulux’s Diamond Exterior line, Behr’s Premium Plus Ultra Exterior Paint, and Sherwin Williams’ Duration, Resilience and SuperPaint lines. Regardless, even these so-called cold weather paints are easier to apply and quicker to dry when it’s warm. Painting outdoors in temperatures below 50°F/10°C should always be a last resort. What About Painting Indoors in the Winter? 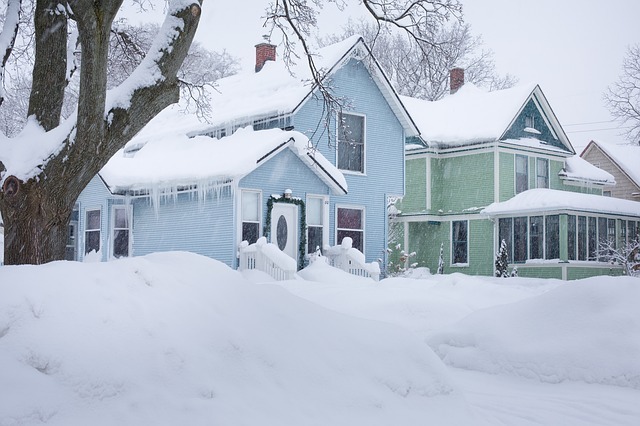 Winter is not the best time to take on an exterior house painting project. But what about painting indoors? So long as the house is warm enough, there’s no reason not to paint your interior walls in cold weather. Getting interior projects done in the winter leaves you more time for those outdoor painting jobs in the summer. The other challenge with painting indoors in the winter is ventilation. If it’s too cold outside to open the windows, you’ll have to ventilate the room in some other way if you are sensitive to drying paint fumes. We also recommend choosing a low-VOC or no-VOC paint. Looking to Paint in the Winter? We don’t hang up our brushes and rollers just because it’s cold out. You’ll find the City Painters out painting in the Greater Toronto Area year-round. Contact us here or give us a call to chat about your own winter painting project!